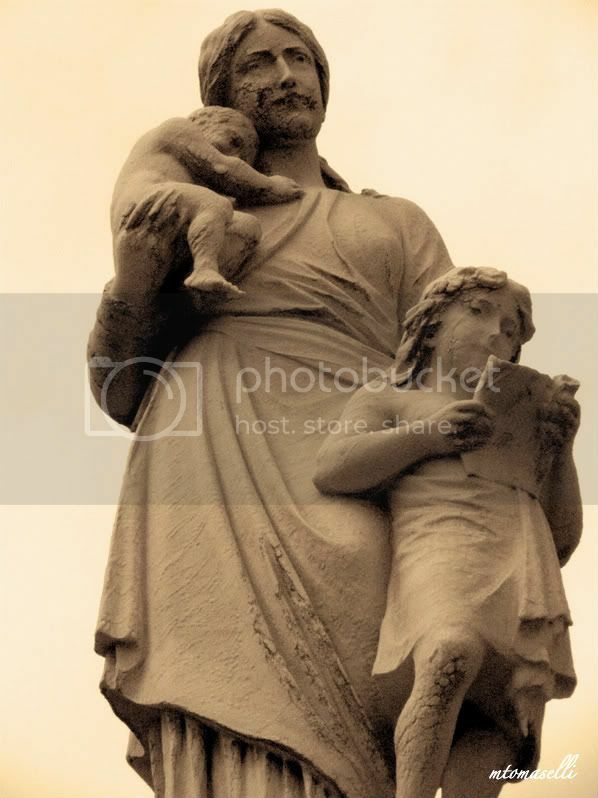 I found these statues in Old Calvary Cemetery, Queens, N.Y. 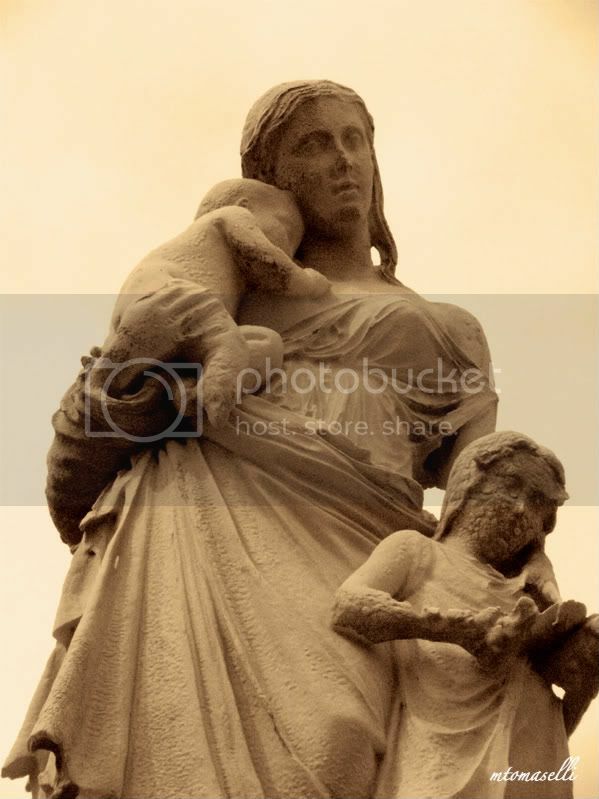 They are quite similar depicting a mother and two children. If you look closely though, they are different in small ways. The drape of the women's dresses, their hair syles, their countenances. 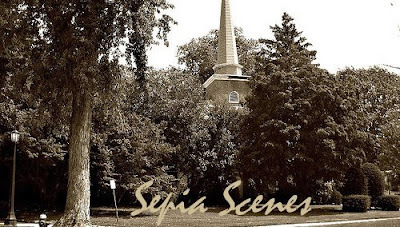 Join us today for Sepia Scenes. Share with all our participants your sepia photo. Will you sign Mr. Linky and leave a comment? Thanks very much! It almost looks like two different artists were working from the same study. And they look marvelous in sepia too! They are different. Luv them in sepia! At a glance I would have thought they were the same if I'd been wandering around that cemetery. You have a good eye to have noticed the difference. These are beautiful statues. I love how the baby is cuddled into it's mother's neck. These statues look wonderful in sepia. I also hope to go searching this spring for interesting statues and cemetery stones to photograph. We are on the same wavelength this week, Mary, enjoying old statues. Clearly these have been out of doors for a long time. The worn texture and crackling is fascinating to see. Wow, stunning Mary. It's like that puzzle game where you have to find the differences in two pictures. I wonder what the history is. Mine are in a cemetery too. Mary these are just wonderful. I am really loving these statues. And I am on time again. Now to go visiting! I'm going to have to get myself to a cemetery. What great shots. Always love what you do. Each sculpture looks similar, as each artist can see the wonder and beauty of a mother and her children. Moving this is, and sepia seems to bring out the true character of both subjects. They are a lot alike! Different works from different artists/companies I believe. Or probably from different eras. These are poignant and beautiful in sepia. There is quite a bit that is different. I have ancestors buried in Calvary cemetery...one set of maternal great grandparents, and one set of maternal grandparents. Wow - you are very observant. I could not tell the difference if that were me hehehehe. It's been a while:) But mine is up! I prefer the first one for the softness of its drapes, but the second for the faces. Wonderful shots! They look really good in Sepia. I'm going to have to go to one of our old cemetery's and take some photos Have a great day!! I like both ways. Some things were just made for sepia. This is a really great Idea. I love sepia! You know I'm lovin' this. I've stayed away from the cemetery on purpose. I didn't want to get burned out. Interesting shots! I love looking at statues like these. I have joined in this time! Hey Mary, I have an award for you on my blog, will you come and get it? WOW...beautiful images and the sepia tones makes them more beautiful.